Hello friends! It’s been a little longer than usual since I’ve written anything for this space. I must apologize for my absence; things have been a little crazy for me lately. As many of you may know, Risen Motherhood recently published an article that I wrote. If you haven’t seen it, you can find the link here: https://www.risenmotherhood.com/blog/mothering-after-childhood-abuse. I spoke about a topic that is very much out of my comfort zone and, between the ensuing nerves and the humbling but amazing feedback, my writing battery has been dead. But I’m back, and happy to be here. Today, I want to share some things I’ve learned on my journey with picky eating. Now, most of these have been drawn from my experience with my toddlers, but please don’t let that deter you from reading if you aren’t a parent. As a recovering picky eater myself, I can confirm that most of these pointers apply to adults too. I was that kid who used to get caught trying to feed their green beans to the dog under the table. As I’m sure you can imagine, she didn’t want them either. Over the years, I eventually did learn to appreciate things I once would’ve turned up my nose at. Like quinoa. How is that trendy now anyway? When it first appeared on my plate, back in the stone age, most people thought it was some kind of disease. It was mortifying, but I digress. Now, I certainly can’t promise that what I’m about to share is particularly ground breaking or that it will fix the picky eater in your life overnight. Think of what you read as guidelines rather than actual rules, and you might find something helpful. Here are my tips for dealing with picky eating! 1: Check with a healthcare provider. This is especially important when it comes to kids. Your child’s doctor can help you rule out any underlying health conditions and make sure that they’re growing normally. Having this reassurance has been huge when it comes to my son, the prince of picky eaters. Not having to worry about his growth frees us to get a little more adventurous with his food. 2: Low your expectations. Nope, even lower. There you go. I’m kidding, but seriously don’t be too hard on yourself. The end game here is a healthy relationship with food and an appreciation of variety, not to finish every last bite of liver and onions. If you assume that you can force pickiness out of someone, especially a child, then you’re setting yourself up for a negative experience. If you can relax as much as possible, you’ll have a much easier time of it. 3: You just have to taste it. This is a great rule that my husband and I have recently begun employing more consistently with our toddlers. Often, we just won’t be able to make them finish their whole plate, and it’s probably not the healthiest habit anyway. Sometimes they truly aren’t hungry. If we constantly force them to eat past the point of fullness, we can mess with their full and hungry cues and leave them less able to determine when they’re actually hungry. Plus, have you ever tried to force a toddler to finish their whole plate? It’s not fun. 4: Aim for a little bit of variety every day. 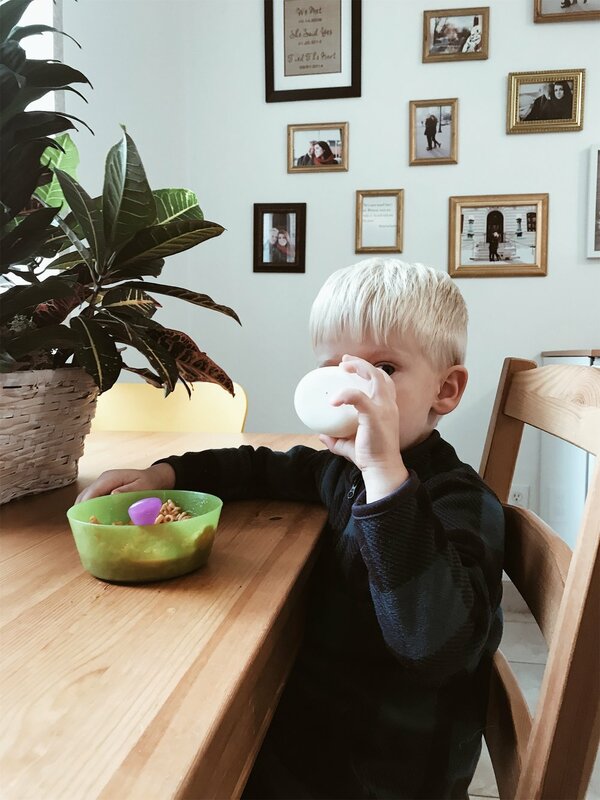 If the picky eater in your life is anything like mine, they like routine. Maybe they only eat from a tiny list of preferred foods or avoid certain food groups entirely. It’s easy to feel trapped eating the same toast, peanut butter and jelly sandwiches, and chicken nuggets every day, so try working in new foods here and there. Maybe you pair a new vegetable with their mac and cheese or a new fruit with their pancakes. 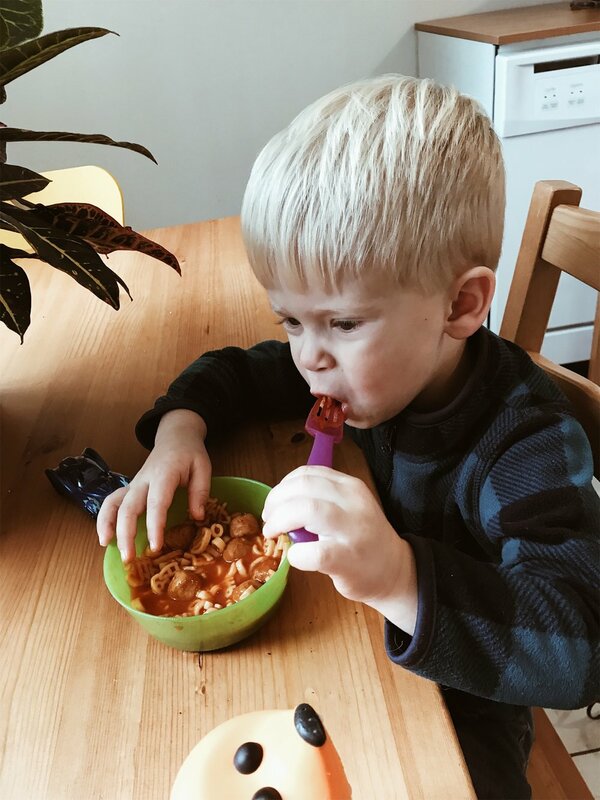 Often, we’ll give our kids two meals that we know they’ll eat and one that’s a bit more adventurous. The goal here is to add in a small amount of something new every day. 5: Use things they already like to help them branch out. This is also working great for my family lately. Find something similar but not identical to the favored item. For example, if it’s rice, try serving it with a new sauce. Or, if your person loves dipping their fish sticks in ketchup, trying giving them cut up veggies and dressing for dunking. Little by little, you’ll expand their horizons. 6: No short order cooking. This is the one that’s hardest for me to put into practice. When you just want someone to eat, the temptation to give into demands for tweaks in the menu can be nearly overpowering. Try as much as you can to resist, however. Getting someone to try your new recipe for coconut cashew curry is a lot easier if everyone at the table is all eating the same thing. The next tip goes along with this one, too. I’ve had to learn this one the hard way. If your individual knows that, if they just wait long enough, they’ll get something they like better than what’s on their plate, they’ll never try anything new. Let them have only what you’re offering until it’s time for the next meal. As hard as it will be, eventually they’ll learn to appreciate what you’re serving. 8: Don’t fill up outside of meals. It goes without saying but, if you aren’t hungry when you pull your chair up to the table, you won’t want to eat what’s on it. Try to limit snacks or space them out so they’re not too close to meals. Drink mostly water between meals so you don’t fill up on liquids. This might be the most important of all these little tidbits. Whether you’re helping a child learn to appreciate variety or you’re just trying to broaden your own palate, it’s going to be a process. Don’t get too discouraged if things don’t go the way you expect. And don’t idolize your goals either, whatever they may be. Don’t value them so much that you can’t bend the rules now and again. Sometimes you really do need to eat cake for breakfast. Well, there you have it. I hope you found something useful, even if it was just the knowledge that you’re not the only one dealing with picky eating. Leave a comment down below with any useful tips that you may have. I’m always up for growth in this area. And thanks for being here, friends.